Our Springs luxury apartments have generous walk-in closets that easily accommodate your wardrobe and accessories. But what do you do with clothing that's out of season or bulky items you don’t use all the time? With a little creativity, you can find ways to keep these items organized and out of the way. Here are some ideas you may find helpful. Vacuum sealer bags, or "space bags," may be the stuff of infomercials, but they've become the go-to method for storing off-season clothing and bedding. Once they're sealed, they fit easily under the bed or on a shelf. Storage trunks that double as coffee tables can hold sweaters and blankets or seasonal accessories like decorations and wrapping paper. Ottomans are another versatile item that serve as handy extra seating when friends are visiting. Baskets come in an infinite number of styles, colors and sizes, making them great storage options. 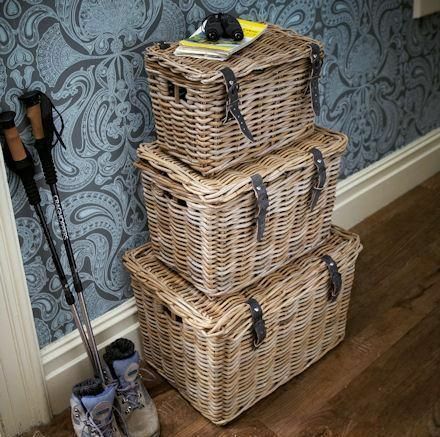 Why not try stacking some pretty wicker baskets to double as room decor? Do you have parents or siblings living in a house nearby? Ask if they can carve out a corner in the basement, attic or spare room where you can park your things. Steal an idea from your childhood and keep skis or skateboards under the bed or couch. 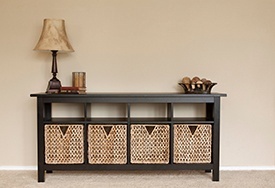 Furniture risers are an inexpensive way to instantly increase storage space. Store a bike on a shelf? Yes, you can! As a bonus, you get an additional surface to use for books, plants or other decorative items. Hang a drawstring bag on the back of a door to hold balls, gloves and other equipment. Doors are also good for Command hooks to hang items like tennis rackets. Depending on the amount and volume of items to be stored, a self-storage unit may be worth the cost. Make sure all clothes and bedding are clean before placing in storage. Take inventory of any items that get packed away in a box. Mark notes on the sides instead of the top so they remain visible. Have you discovered any clever storage tips? Share them with us in the comments!